Review: Clive Candy a British Officer leads his way into three wars, three loves and also a lifetime friendship across enemy lines. 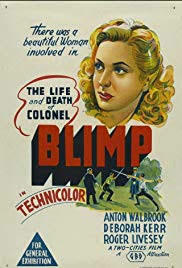 Colonel Blimp was a British cartoon character in a then well-known strip in the day. A very moving and fascinating film to watch. When this film was released Prime Minister Winston Churchill hated the film and tried to have it banned. At the end of the film, the camera zooms in on some tapestry, the Latin phrase “Sic Transit Gloria Candy”that is shown translates to, “Thus passes away the glory of Candy”. Astonishing performances from both Roger Livesey and Deborah Kerr who plays three different characters. This sure is one of Britain’s finest masterpieces. Film critic Peter Bradshaw once wrote “This glorious film is about the greatest mystery of all: how old people were once young, and how young people are in the process of becoming old.” In 2013 the late film critic Barry Norman produced a list in the Radio Times of the Top 50 British Films and this was listed amongst the list.